Eugene Ryan is a university teacher in Japan and a researcher studying the effects of bilingualism on the linguistic and cognitive development of children with Autism Spectrum Disorder (ASD). He is also the father of a bilingual child with autism. In Part 1 of our interview, he generously shared the early struggles and successes that he and his wife experienced in their quest to support their son’s language development. In Part 2, now 16 months later, Eugene describes the latest stage of their bilingual journey together. Again, my warm thanks to Eugene for offering his experience and insight to others. It’s been over a year since our first interview. What has changed for your family since then? Teeda is now getting ready to go to elementary school, and his little sister Ursula is a very verbal, sly 4 year old. What hasn’t changed is our commitment to raising both of our children bilingually. Thanks to my shorter commute, I get to spend more time with the kids than my partner, so breakfast, school runs and so on are all in English with Dad. Their schooling and almost all of Teeda’s therapy are in Japanese. My wife and I speak English to each other, and both of us speak to the children mainly but not exclusively in our native language. Is there any confusion from this mixture of language exposure? Not for the children, no, but we as parents went through a period of being pretty mixed up ourselves. In the beginning I tried a complex system of dividing language use at home by days between English and Japanese. It soon became clear that this was absurdly unrealistic. At that time a friend advised that we each simply stick to one language. We tried this approach, which had the winning virtue of simplicity, and was positive in that both of us could then be relaxed about using our native language in conversations with Teeda. Research suggests that parents using their native tongue with their children is beneficial both in strengthening family bonds and developing the child’s linguistic ability. (Cummins, 2001) It was still hard though to maintain a pure split, and we were also worried that Teeda was often mixing languages in the same sentence. A research colleague was later able to assure me that provided each part of the sentence is grammatically correct, this kind of code mixing is a normal and even beneficial part of multilingual development. (Li & Oi, 2014) This new knowledge has helped us enjoy listening to what he wants to say—phrases like “I ate ten ichigo (strawberries). I get very dirty.”—without getting hung up on the language. In our last interview, you said you felt that bilingualism didn’t hinder the language development of a child with autism. Sixteen months later, have you found this to be true? I was also encouraged by the response to our last interview, as I received messages from parents all over the world who had overcome resistance from schools and doctors and successfully raised their children bilingually. Finally. there is the evidence of Teeda’s growth and development in both languages. While Teeda in any case experiences language delay in both languages, he is gradually catching up. In a series of bilingual tests conducted at a year’s interval (October 2013 and November 2014) by my research colleagues, it could be observed that Teeda had bridged the gap between his two languages with the exception of grammar, where an apparent stalling of progress in English was balanced by a dramatic improvement in Japanese to an age-appropriate level. It is often hard to capture the abilities of children on the ASD spectrum by means of tests, but our home life also suggests to us that Teeda has grown significantly in both confidence and ability, particularly in English. His perception of the world, which we gauge through the focus of his questions, has grown from the immediate environment to encompass an awareness of time and distance. So, for example, he asked me recently about where his (English) aunt lives, or about the meaning of some of his favorite films or stories. When he lacks vocabulary he can get creative, such as when he woke up hungry and asked for “night breakfast.” Over the past year he has become a fluent and enthusiastic reader in both languages and has just begun a daily diary written in Japanese. You said Teeda asks about his extended family in England. How does he cope with having family members in two different countries? Nowadays he seems pretty happy and adjusted about this, but it hasn’t always been easy for him to deal with. Basically, it seems that Teeda sees himself as being English, or at least shows a clear preference for the language. Whenever we have to make a decision on which language to choose for TV shows, our daughter will always ask for Japanese, while our son never fails to request the English version. Except when addressed in Japanese, or mixing languages to make himself understood, it is clear that English is his base language. However, adapting to spending time in both countries (we go back to England every summer), is something that Teeda has not always found easy in his life. The summer of 2013 was particularly dramatic in this regard. England had previously been the scene of some of his biggest meltdowns, when we first struggled as parents to understand that suddenly our boy was not at ease in big gatherings of friends and family. That summer, though, he surprised us all with his social confidence and positivity. He seemed delighted to meet his aunts and uncles again. I remember watching him at the park approach other children to successfully elicit play, something he had never to our knowledge managed in Japan. He seemed overall more positive, more connected than we had seen him before, but when we got back to Japan he really struggled to adapt to being back. Any child might reasonably be expected to prefer days of ice cream, hug-crazy aunts, and trips to the park on a shiny red bicycle to a return to the daily routine of school and therapy. His sister was notably mutinous at the time, too. But with Teeda it seemed to go deeper. The friendships which had been developing nicely before summer seemed to peter out, and for a while he struggled to remember which language to use at school. I used to watch him in the playground when I came to pick him up, and it hurt to see how lost he seemed to be in his own world. As late as the winter of 2013-2014 he would still ask me, several times a week, “Dad, can we go to England?” Once we realized that this phase wouldn’t simply pass, we decided to act. We decided to try to help him feel more at home in Japan. One part of the strategy was to get a hard disc recorder so that we could compile fun-looking kids’ TV shows for him to watch. The cute characters began to eat away at his resistance, and he gradually started quoting them in Japanese. At the same time we shifted the balance of his therapy from a 50/50 mix of both languages to 100% Japanese. We made time for a nightly session of Applied Behaviour Analysis (ABA) in Japanese using techniques we learned from one of Teeda’s regular therapists. Teeda seemed to enjoy these sessions with us in particular, and we were encouraged to see how much he could learn in a one-on-one supportive environment. Were you concerned that his English would suffer as a result of this concentration on Japanese? Yes, a little. Our time together was still all in English, and I was reassured by his continued enthusiasm for talking, watching TV, and now voraciously reading in English. In any case I fully supported the change. It seemed clear to me that his social disconnect was damaging his self-confidence, and I was beginning to feel through long observation that this confidence more than anything else was the key to his development. At home he was confident and expressive with us. I wanted to help him gain that confidence in the playground and the classroom, so I could see the value in trying to boost his Japanese to help him grow socially. How did your son respond to these efforts? We can certainly say that Teeda has progressed well. I keep a diary of his progress, and already by January of 2014 he was showing signs of entering a period of blossoming growth. It’s hard to know in the end if it was the result of the boost to his Japanese, the extra attention from his parents through home therapy, or just a process of maturation that was at the bottom of it. At first his new confidence was more manifest at home, so for example he was able to politely invite a Japanese boy who was visiting our home to play together. He seemed to be conscious that he was doing well, such as when he took his little sister’s hand to walk her safely across a road, and said, “Look Dad!” (Did you see what I did there?). By February he was starting to integrate a little better at school. While he didn’t have friends as such, he gradually learned the social rules, such as losing at games like rock-paper-scissors with grace, that enabled him to interact more smoothly. When Teeda graduated to his new class in the spring, with a new set of classmates and teachers to get to know, he initially withdrew totally. Thankfully one of the new teachers was dynamite: warm, effusive, and sensitive to Teeda’s condition. Following her example, Teeda’s classmates became very open and supportive towards him. By the summer he had a new girlfriend, to whom he used to read picture books after school, and he would list up to me the friends he had played with when I came to pick him up each day. He even began to talk to us about who he was, by sharing his dream to become a policeman in a rocket car. What advice would you currently offer to parents in a similar situation? Last time I explained why we decided to raise our son, who is on the autistic spectrum, bilingually. Over the past year the questions we have had to face regarding our son have been more about the impact of his having to find a place for himself in between the two cultures of his parents. In particular we could see that Teeda seemed to be more vulnerable than his sister to, for example, the effects of culture shock and reverse culture shock. I wonder if during some of the more challenging periods of his life, he came to imagine England in an ideal light as the place where he really belonged. As he matured and developed, I suspect that the need he felt to imagine a perfect “other” place became gradually displaced by his growing confidence about who he is. Seeing him struggle to find his way did at times give me pause to wonder if living between two cultures might not have been too much to ask of him. At the end of the day, however, whatever input we may offer, identity is not something we can decide for others. On the one hand, Teeda has taken lately to announcing in an official sounding tone, “My name is Teeda, I come from Japan!” And yet the remarkable fact is that even though he lives in Japan, and his formal education and therapy is all in Japanese, his English has proved amazingly robust. With limited help over the years, it has continued to flourish, and remains his language of choice. Equally he is still as keen as ever to be bear-hugged by his English aunts and uncles. While being wary of my own bias, to me the persistence of his commitment can be understood as a choice. I wish to respect that choice. How can people contact you or find more resources? Related post at Bilingual Monkeys: Can Children with Special Needs Be Bilingual? Eugene teaches at a university in Aichi Prefecture, Japan and researches the effects of bilingualism on the linguistic and cognitive development of children with Autism Spectrum Disorder (ASD). He has lived in Japan for more than 16 years, and his wife is Japanese. They have two children, a six-year-old son who is mildly autistic and a typically developing four-year-old daughter, and are seeking to raise both children bilingually. Want to read both parts of Eugene’s story in French? Elodie Chatelais of Little Bilingues kindly translated the articles for her blog. This is such a touching and inspiring story. Thank you both very much for sharing. We regularly get questions from our parents on just such topics and it’s great to have a place to point them to. We wish you the best of luck in your journey and look forward to future posts on the topic. Thanks for the supportive message, much appreciated. I would be happy to answer any questions from the parental perspective, either directly or via the Facebook page. Some of the research is available on the website. The special needs section of the Bilingual Zoo is also a good place to look. 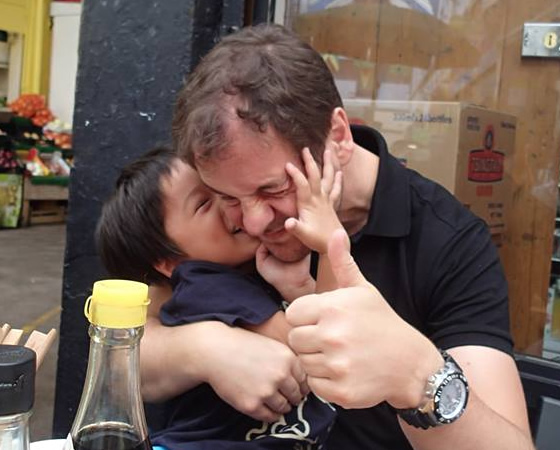 I recently read both of the articles about your son–with great interest, as I also live in Japan (Tokyo), am married to a Japanese, and have a child with an Autism Spectrum Disorder. Lisa (27) is much lower functioning than your son however, and has never spoken a word of English or Japanese. I was saddened to read about the reaction of your therapist when you asked him to refer you to someone for a second opinion. From the posts of other readers, it sounds like this is quite common, but I would like people to know that it is not always that way. Our daughter also has very difficult-to-control epileptic seizures. I have been amazed by the honesty and humility of the doctors here who have tried to treat her. One doctor admitted that he didn’t know what else to try with her and recommended that we take her to another hospital. Now she is being treated by one of the authorities on epilepsy in Japan, but he doesn’t act at all like a “know-it-all”. He is very open to my suggestions about changes in Lisa’s medications, so I feel like we are working together to find a solution. I’m so happy to know that your son is making such great progress. I hope his transition to elementary school goes well. Thank you for the response, and in particular the encouragement for our son. I hope that your daughter’s treatment develops well also. Reading what you say, I would reluctantly admit that my attitude to professionals is a bit cautious as a result of my experience. That said, our son has received invaluable support from some excellent therapists. The good ones can make such a difference, I’m not always sure that they get the recognition they deserve, perhaps even from me. We will be moving house this year, and finally have the space to invite people, so I have been hoping to throw a thank you party. Your mail encourages me to make it happen.